The vibrant resort town of Whistler and its stunning surrounding region is predominantly known as a world-class winter destination, attracting millions of ski and snowboard enthusiasts to its slopes every year. But there’s so much more to Whistler than the snow. Come spring, when the snow cover melts away, temperatures start to rise and the days get longer, a whole new world of adventure opens up. Opportunities range from scenic sightseeing, hiking, canoeing and wildlife spotting, to adrenaline-fuelled mountain biking, climbing, zip-lining and white-water rafting. Of course, there’s plenty on offer for those who want to take it easy as well, whether it be a serene paddle down tranquil waterways, lounging and picnicking on the shores of a mountain lake, or sampling some of the region’s most exciting cuisine in one of the village’s acclaimed restaurants. Whatever your fancy, Whistler is the perfect place to experience the best of summer in British Columbia. Situated in the heart of a spectacular National Park, Whistler sits nestled at the feet of two immense mountains: Whistler and Blackcomb. The entire region is brimming with high impact scenery, with towering volcanic peaks, ancient glaciers, raging rivers, teal-blue lakes and dense coniferous forests greeting you at every turn. Not sure where to start to experience the best of this natural splendour? 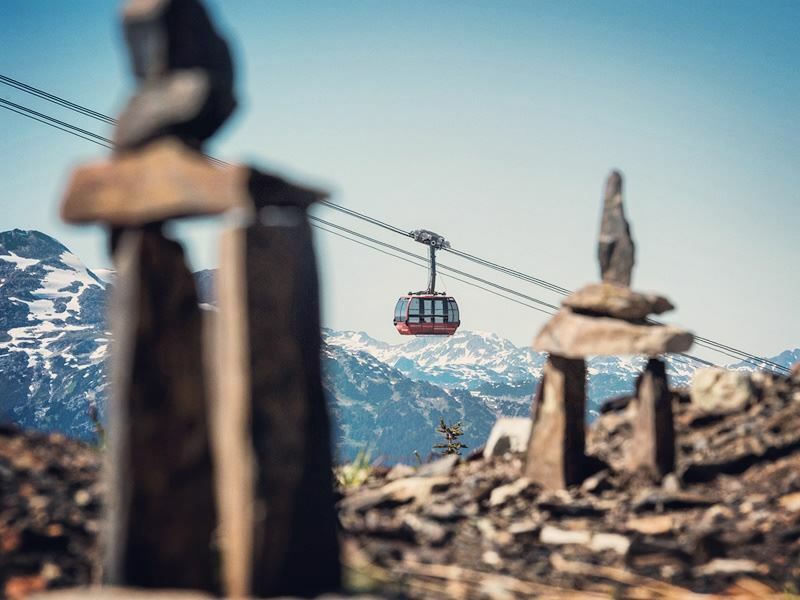 Perhaps the number one must-do in Whistler during the summer is to head for the PEAK TO PEAK Gondola, the record-breaking longest continuous lift system in the world. Take a jaw-dropping ride up the mountain on an open-air chairlift to gain access to “BC’s rooftop on the world”. From the multiple summits, enjoy eye-popping panoramas over mountain peaks, verdant forests and the expansive valley far below. This sightseeing trip is perfect for those short on time or for those who simply want to experience the ultimate mountain highs without the sweat! 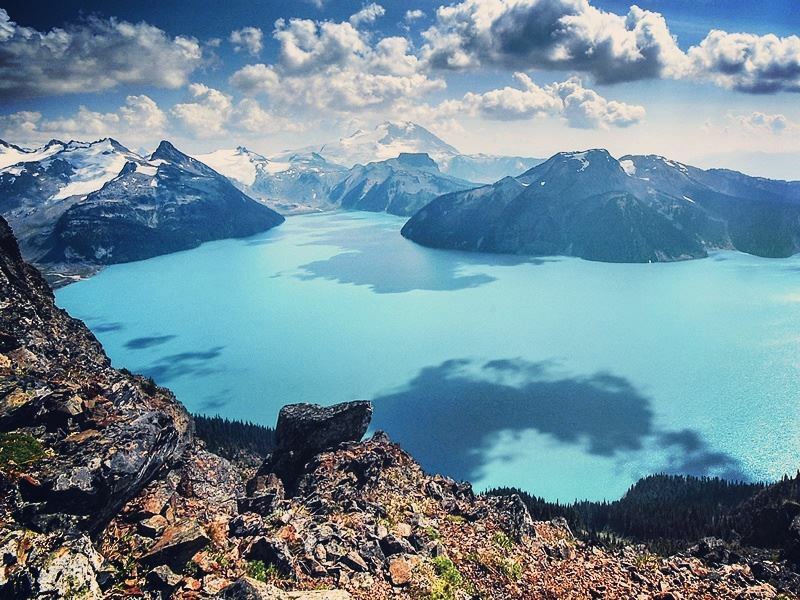 From the top of Whistler Mountain take in sweeping vistas over the mighty peaks and glaciers of Black Tusk, the Tantalus Range and the magnificent Garibaldi Provincial Park. Meanwhile, from the 7th Heaven Summit on Blackcomb Mountain spend time admiring the 360-degree perspective across the lush Fitzsimmons Valley and beyond. Iconic photo opportunities abound at every turn, so be sure to allow plenty of time on top. There are also free and custom guided tours to help you make the most of your visit, as well as interpretive circular walks, dedicated lookout points, places to eat and a full calendar of seasonal events. Admiring the impressive mountain-top views certainly provides a fantastic introduction to Whistler. But if you really want to get to grips with the incredible alpine landscape, then there’s no better way than to dive into the area’s extensive 50-kilometre hiking trail network. There are numerous routes to choose from - ranging from easy family-friendly strolls to challenging ascents - that enable everyone to experience the majestic scenery that makes this one of the continent’s premier trekking destinations. And thanks to the lift-access, you won’t need to expend valuable energy getting up high, instead spending the entire day amidst snow-capped peaks, flower-filled meadows and alpine lakes. Here are just some of the best trails out there. High Note Trail: Radiating out from the top of Whistler Mountain, this is one of the most rewarding hiking experiences in the area. As you negotiate the rugged terrain, ascending and descending over high alpine traverses, you’ll be treated to marvellous views over Black Tusk and Cheakamus Lake. Signature Walk: This easy loop walk is the perfect introduction for first-time visitors. Starting from Whistler’s summit you’ll wind through stunning subalpine terrain and enjoy mesmerising vistas over the village and surrounding valley far below. The Skywalk Trail: One of the newest trails to open in Whistler, this spectacular route winds through old-growth forests and past a series of splendid alpine lakes. It’s long and steep so best reserved for experienced hikers, but the picturesque views make it one of the region’s best-kept secrets. Overload Trail: For those on Blackcomb Mountain, this signature trail provides a sweeping overview of the area, as well as access to additional trails further afield. A highlight of this route are the alpine meadows that burst with colour during the wild flower season every mid-summer. Whistler also lies in close proximity to the world-class wilderness reserve of Garibaldi Provincial Park. 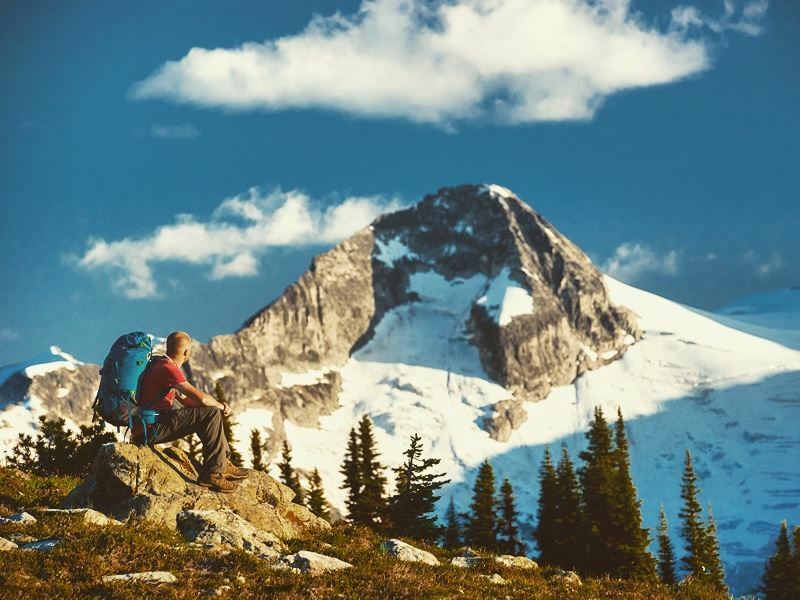 Home to countless rugged backcountry treks, this is the perfect place for multi-day camping expeditions and adventurous types in search of solitude. For those who want to take it easy, there are over 40 kilometres of paved trails winding along the valley floor, perfect for a leisurely stroll or cycle whilst admiring the scenic surrounds. 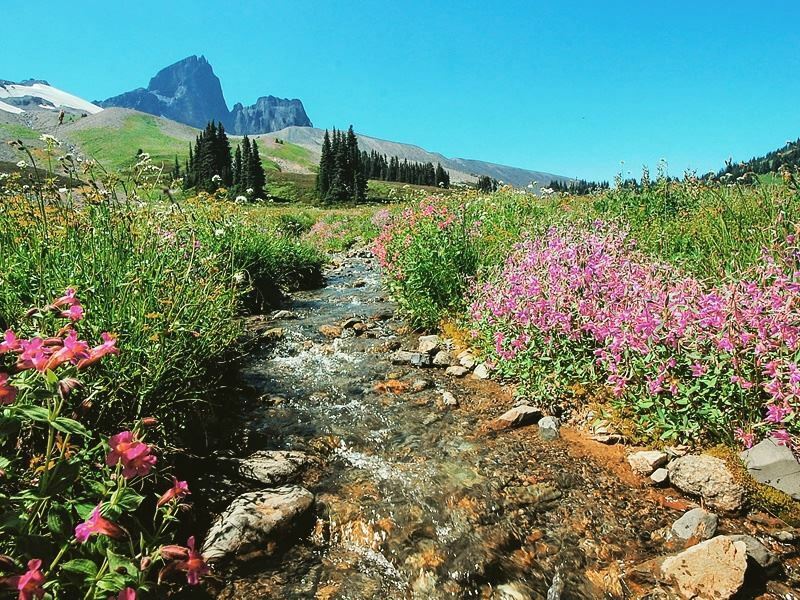 A highly anticipated highlight of Whistler’s summer is the alpine wild flower season. For two to three weeks each July, numerous species come into full bloom in a fleeting yet spectacular explosion of colour. The addition of bright crimsons and deep purples to the already stunning mountain and forest backdrop, make this seasonal event well-worth planning your visit around. Wildlife lovers will also want to keep an eye out for the bald eagles, marmots, deer, chipmunks and myriad other species that call this area home. Best of all, Whistler is home to a population of 50 or so wild black bears. Eco-tours visiting bear dens and feeding areas provide a chance to witness these majestic creatures in their natural habitat. One of the most popular summer pastimes in Whistler is mountain biking. In fact, the resort town is something of a biking mecca, home to North America’s largest mountain bike park, along with a huge network of cross-country trails that attracts riders from across the globe. The Whistler Mountain Bike Park is one of the best in the world, offering an incredible collection of life-serviced downhill trails. There’s something to suit bikers of all abilities, with green trails, technical double blacks, a jump and drop area and plenty more. There are also hundreds of kilometres of longer trails awaiting exploration, weaving through old-growth forests, over precipitous rock faces and past cascading waterfalls. Experienced riders who want a want a real test of their skills, as well as ample rewards for their efforts, should ride “Comfortably Numb”, a world-class trail along challenging sub-alpine terrain boasting unbelievable views along the way. If you’re looking for an even bigger adrenaline-rush, along with plenty of height and endless panoramas over the surrounding mountains, why not sign up for some heli-biking? 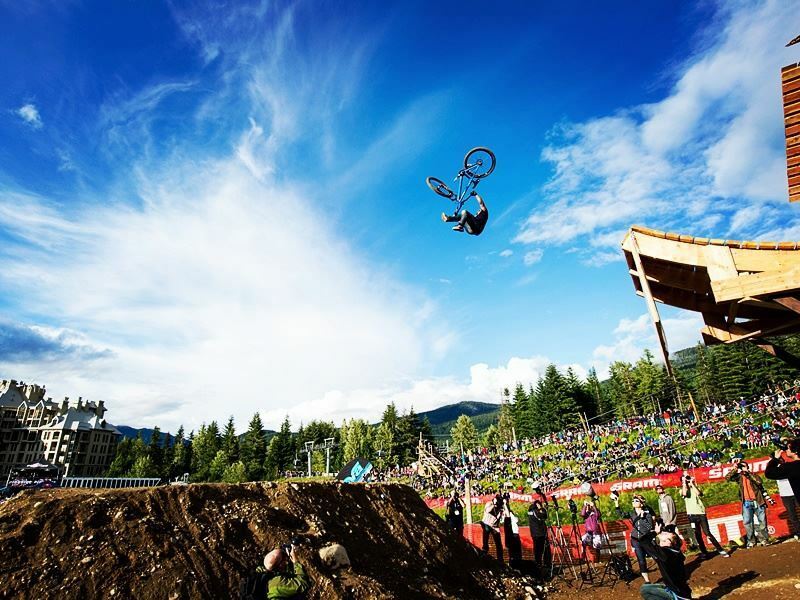 If you prefer to spectate, don’t miss out the multi-day Crankworx festival in August for a chance to watch the best free-riders in the world break out crazy stunts and gravity-defying runs. Zip-lining offers thrill-seekers the perfect opportunity to explore Whistler’s beautiful forested valleys, creeks and rivers, all at highway speeds and from heights of up to 180 feet! Ziptrek Ecotours will lead you along a series of suspension bridges and five exhilarating zip-lines, including one heart-pounding 2,000-foot line that drops over 20 storeys. Those with a head for heights should also sign up for a guided tour at Via Ferrata on Whistler Mountain. This engineered cliff pathway is accessible to inexperienced climbers and boasts a dizzying vertical perspective from the top. The truly brave can also try a spot of bungee jumping above the roaring Cheakamus River. 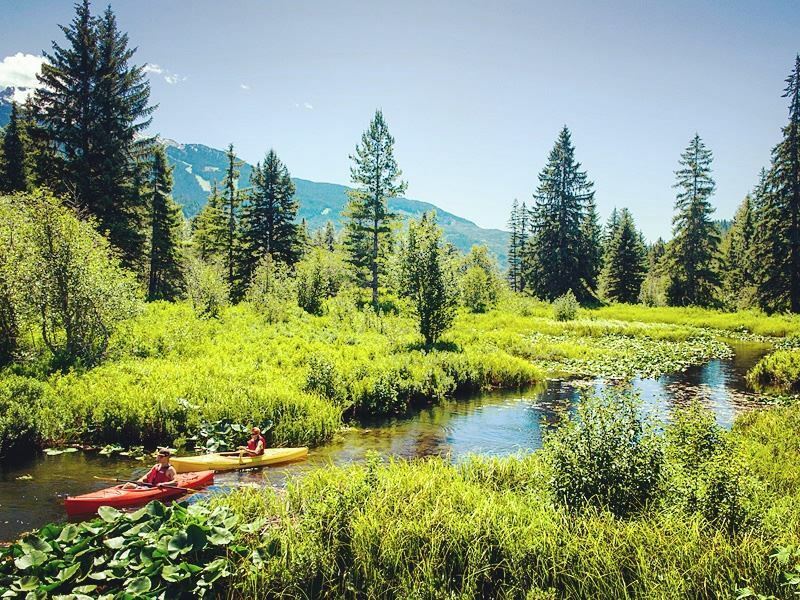 With the arrival of warmer temperatures, another great bet is to head for Whistler’s numerous alpine lakes and rivers. Whether to canoe, kayak, raft, swim, windsurf, or simply relax by the shore, summer is the ideal time for a host of water-based fun. The spring meltwater transforms Whistler’s rivers into lively runways that are the perfect place for adrenaline-fuelled white water rafting. For a more tranquil experience, rent a stand-up paddle board and spend the afternoon gliding through the placid waters of Alta Lake. Or sign up for a highly recommended canoe tour of the River of Golden Dreams – as the name suggests the stunning scenery will not disappoint! Another favourite pastime of locals and visitors alike is heading to Lost Lake or one of Whistler’s many beaches. Bring a picnic basket or cook up a feast at an on-site BBQ, cool off in crystal clear mountain waters, and spend time simply relaxing, soaking in the sun and picturesque setting. When you’ve had your fill of outdoor adventure, treat yourself with food, drinks and entertainment at Whistler’s world-class restaurants, bars and nightspots. A lively resort town packed with an endless array of diversions, Whistler village is a worthy destination in itself and the perfect spot to recuperate or let your hair down after a long day in the mountains. With a culinary scene to rival that of any big city, encompassing no less than 200 dining establishments, you’ll find plenty of foodie delights to satisfy taste buds. 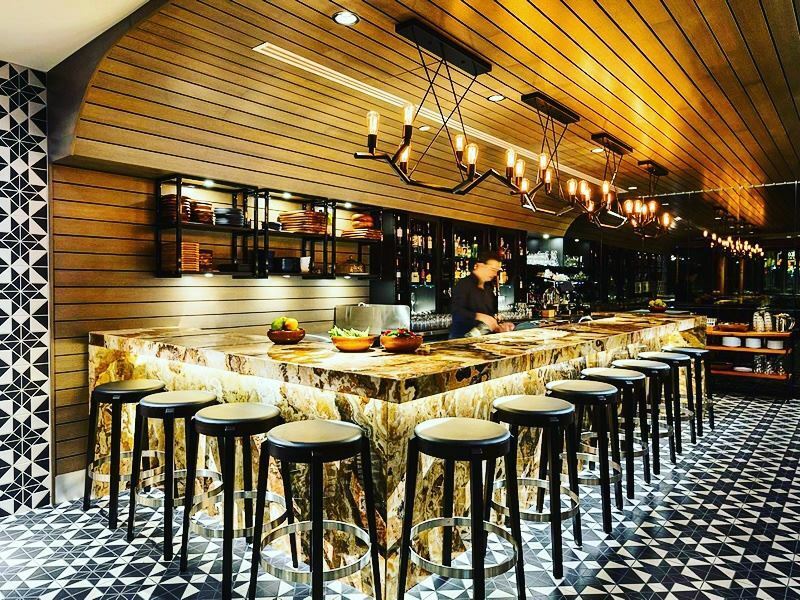 Some of the best restaurants in Whistler include the world-class Araxi. Run by one of Canada’s leading chefs and an early pioneer of farm to table dining, this place serves up an incredible array of skilfully-executed dishes, from fresh oysters and seafood, to inventive salads and decadent desserts. Rimrock café is the place to go for fine fish and game dishes, as well as to enjoy a rustic elegant setting, intimate atmosphere and extensive global wine list. Local favourite Red Door bistro specialises in fabulous French fare with a West Coast twist. The service here is exceptional and there’s an elegant bar where you can enjoy your food and drinks overlooking the open kitchen. Bar Oso is a recently launched sister restaurant of Araxi, serving up Spanish-style tapas, homemade charcuterie and delightful hand-crafted cocktails. Whistler is also known for its lively après nightlife, with an endless array of pubs, bars and clubs to choose from depending on your mood. Enjoy delicious craft beer in a cosy pub or stay up late drinking sake in the numerous local sushi houses. Treat yourself to cocktails in a classy lounge or dance the night away to everything from house, reggae or soul, to the latest beats from internally-renowned DJs. If you’re new in town, consider joining a guided Whistler bar crawl tour for an introduction to some of the most exciting nightspots. For a taste of the best nightlife Whistler has to offer, head for GLC, voted one of the continent’s best après bars, Dusty’s Bar or Longhorn’s for fantastic outdoor heated patios, and Merlin’s or Mo Joe’s for live music, DJs and partying into the small hours. Fairmount Chateau Whistler: Offering an unrivalled luxury experience, this 5-star establishment boasts top of the range accommodation, exquisite cuisine, epic golf courses, an elegant pool and a soothing spa, all in a sublime mountain setting that can’t be beat. Delta Whistler Village: Treat yourself to a stay at one of the Delta’s delightful suites, each equipped with fireplaces, balconies, spacious living rooms and modern kitchens. With a range of great amenities including a large outdoor pool, attractive bar and restaurant and a central location right in the heart of the village, this is the perfect place to base yourself for a summer of outdoor fun. Hilton Resort & Spa: Located at the base of Whistler’s mountain gondola, this luxury resort offers guests a full range of quality facilities, including pool, fitness centre, tennis courts and an acclaimed restaurant. 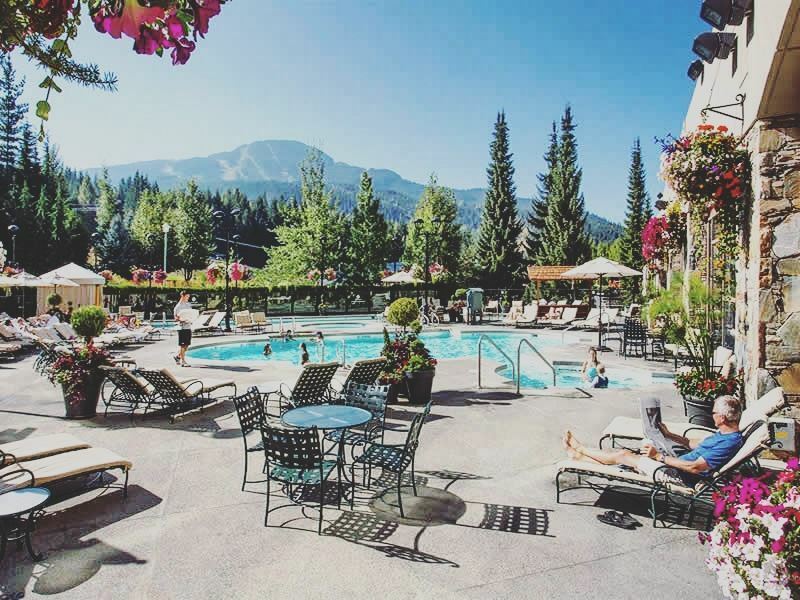 It’s a wonderfully rejuvenating environment in which to recoup after a long day in the mountains, whilst being a stone’s throw from some of Whistler’s best boutiques, restaurants and buzzing night venues.